Toker Dam is protected by a detachment of the EDF. In their free time they attend a high school for combatants. Today they were all on station for guard duty. When we stopped to ask how much the level of water had risen some said as much as 7 metres while another suggested even 10 metres. Well we continued down the Pump Station Road to see for ourselves. The road is bumpy (like most in Eritrea) but what was worse is that there weren’t any guard rails on this very narrow, very steep road. But once we caught a glimpse of the reservoir we knew it was worth it. 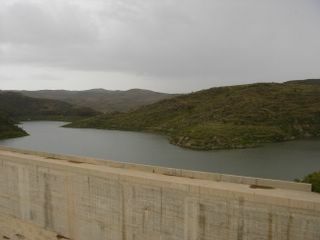 From the concrete face of the dam back towards the rear of the reservoir, hundreds of thousands of litres of grey-blue water. 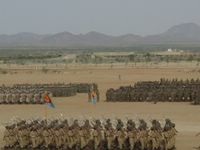 Sawa, also known as the Eritrean Defence Forces Training Centre, is also a school. At this school only the twelfth grade is taught. The National Matriculation Examination is also taken at Sawa after which you may receive military training. In this training, the soon to be citizen-soldiers of Eritrea are trained in both military discipline, tactics, and taught to become more physically fit. During peacetime the military training phase is to last some six months while the National Service phase is to last one year. During wartime however, this can be extended indefinitely. Outside of Keren is the Elabered Estate. From this plantation comes milk and fruit. To truly make this a heaven the only thing missing is the honey to make ambrosia. Nonetheless this small heaven on the road to Asmara from Keren is beautiful. Gerset is a town just half an our south of Tesseney. To call it a town may be a bit of an overstatement but we will give it the benefit of the doubt. 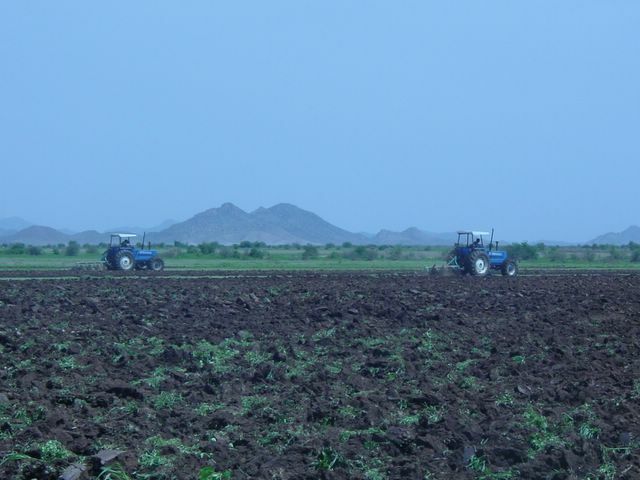 Gerset is a place that has mostly been settled now by Eritrean returnees from Sudan. Where they have decided to settled is both prime farming land but quite prone to flooding. Here though a damn is being constructed to both hold irrigable water for a test plot of 1000 hectares and prevent flooding in the area. For the past two days I have been on a bit of a jaunt to western Eritrea. What I saw amazed me. Years ago, back in 2001 I had been as far west as Barentu but no further because after the war gas was difficult to find in the area. Anyway, back to 2005 and what had to be the most impressive trips I have ever been on. It is likely that most people wouldn’t be as amazed as I was but what could be seen was marvelous. 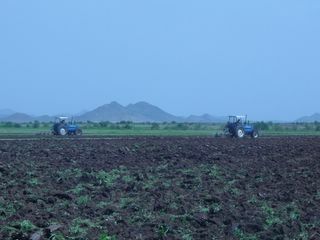 The strides towards food security despite the setbacks of war and drought in Eritrea is amazing.